100 Mobile Web Templates is your solution to finding your target audience and making sure they see that you are visually present via mobile. With this template, you bring your business to the mobile stratosphere which is incredibly important for the health of your business. Stats show that half the world is searching for businesses through mobile. And of course every one and their dog has a mobile phone these days and that makes it ultra important for you to have the modern and efficient, up to date, fully functional presence across all mediums so that they can find you easily. You don’t want to be missing out on money surely. Don’t waste your chance to break your sales wide open and produce crazy mobile business success using this exceptional product. There’s a wide selection of templates available to fit your specific needs and what you do with it, you need to do it soon as everyday when a potential customer isn’t finding you on mobile, you’re losing a sale to a competitor. 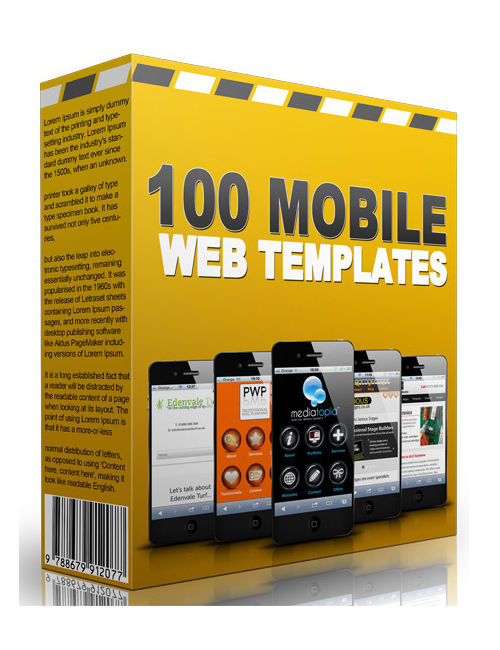 100 Mobile Web Templates is a step in the right direction. Time for you to make the download and start stepping.